Editor’s Note: The following post was provided by Virginia Woolf scholar Beth Rigel Daugherty. She wrote this recommendation of a 2017 immersive course in Cambridge on Virginia Woolf, organized by Trudi Tate and Ericka Jacobs, after attending the summer 2016 session. 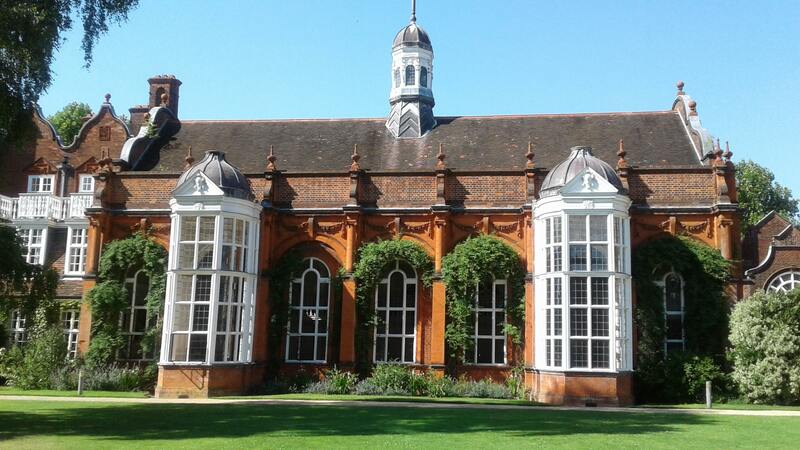 Woolf’s Rooms is one of two immersive summer courses on Virginia Woolf organized by Literature Cambridge in July 2017 at Homerton College, Cambridge. Each will include lectures, supervisions, and excursions. If the 2016 summer five-day course on Woolf is any indication, Beth says, “those seeking mental food in the summer of 2017 will find it delightful and stimulating. From the time we arrived on the afternoon of July 17 to the time we left on the morning of July 23, the accommodations and grounds at Homerton College sheltered us comfortably amid garden-lined walks; the meals, many of them prepared by the Cambridge Cookery School next to Homerton, provided us with healthy and beautiful food; the reading list, some novels and a few essays, gave us intellectual anchors, and the Cambridge experience, supervisions and all, kept us busy thinking and talking. We focused on a different Woolf text each day by way of a lecture, a supervision, and an extra event or excursion of some kind. We read “How Should One Read a Book?” and “Leslie Stephen,” A Room of One’s Own, Mrs Dalloway, To the Lighthouse, and dipped into The Waves. We listened to Susan Sellars, Trudi Tate, Alison Hennegan, and Gillian Beer. We went to Girton and Newnham Colleges, visited Bloomsbury where we saw the inside of 46 Gordon Square and visited the British Museum, and travelled to Grantchester for tea and a talk by Claire Nicholson on Virginia Woolf and Rupert Brooke. We got handouts, bibliographies, and maps. We enjoyed hearing Susan Sellers read from Vanessa and Virginia and Claire Nicolson talk to us about the women’s colleges in the Girton room where Woolf talked to the young women there, a room lined with incredible embroidered panels done by Lady Julia Carew in the nineteenth century. 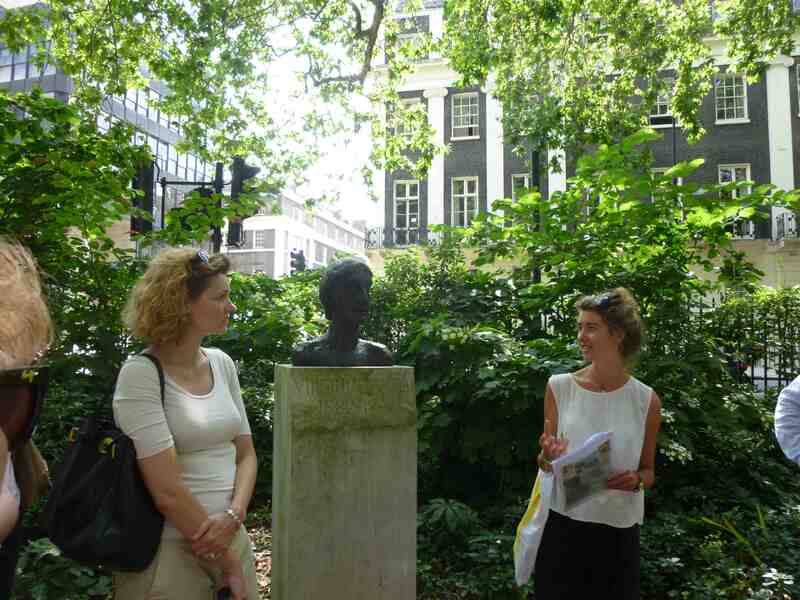 We learned about Newnham traditions and book collections from Development Director Penny Hubbard and the current Librarian Debbie Hodder, and we saw and learned about the Bloomsbury art lining the rooms on the 3rd floor of 46 Gordon Square from art historian Claudia Tobin. The supervisions were particularly interesting for those of us unfamiliar with the Cambridge and Oxford style of education. In the hour-long sessions, three or four participants asked questions about or commented on specific textual passages of their choice with a faculty member, thus combining close reading with discussion. Participants talked with each other and with the supervisor about the meaning of particular words or phrases, about the historical or cultural context of the passage for Woolf, readers at the time, and us, and about the connection of such passages to the work and Woolf’s writing as a whole. Heady stuff! Also, the blend of intensity and freedom during the course was just right – every day, we had several hours of free time for reading, conversation, naps, or travels into Cambridge city centre. Plus, the whole incredible week was topped off by a formal dinner and an amazing presentation by Kabe Wilson, who has an MPhil in English from Cambridge. Using every single word used by Woolf in A Room of One’s Own, Wilson has created an original text about a mixed-race woman student struggling against Cambridge’s (and Woolf’s) exclusion of her, Of One Woman or So by Olivia N’Gowfri. (See more about Kabe Wilson. What really made the week, though, were the people. Twenty-one of us came from around the world: Japan, Israel, Denmark, Sweden, Germany, Belgium, Holland, Austria, Canada, Scotland, England, and the US. We viewed Virginia Woolf through very different lenses and perspectives, and we had come to Virginia Woolf through very different texts and from a variety of subject areas. When we introduced ourselves on the first day by describing how we first met Woolf, only a few of us mentioned school; several described near-conversion experiences; and all spoke movingly about those initial encounters, our memories of when passion for her work ignited. We were common readers, students, and a sprinkling of academics; we were young, middle-aged, and retired; we were women and men. But we were united in our love of Virginia Woolf’s language and work, our open curiosity, our hunger to learn more. It was an extraordinary week, begun with some trepidation and uncertainty and ending with intellectual bonding and camaraderie. Trudi and Ericka had thought of almost everything, and when they hadn’t, they responded quickly to questions or concerns. We were supported in a lovely venue and by a clear framework, and we were challenged by lots of questions (many of them reverberating still) and the injunction to read, re-read, and re-think, to keep consulting the text, to see Woolf and her texts again and again. Trudi and Ericka solicited all kinds of feedback about how they could improve the course, so some of the details for the 2017 Virginia Woolf in Cambridge will surely change. But you can count on their making every effort to create a warm, welcoming, and supportive environment for engaging with Woolf and her work next summer, when the theme will be Woolf’s Rooms. Do consider becoming a student at Cambridge for a week – you’ll be glad you did!